During the twentieth century the radial arm saw was introduced, evolved, became a great success over a couple of generations, and then became largely obsolete. This section covers the history of circular cross saws before Ray De Walt's introduction of his first radial arm saw. 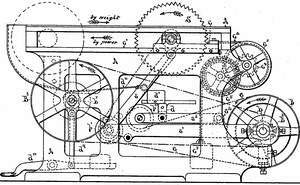 In 1869 Charles R. Tompkins patented a swing saw. 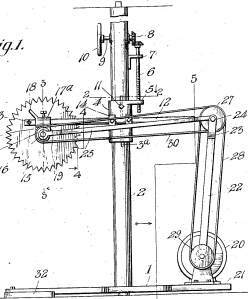 Swing saws already existed then but this is the earliest swing-saw patent we have found. Tompkins manufactured his saw for many years, and his was just one of several such saws on the market. Levi Houston Co., American Saw Mill Machinery Co., Bentel, Margedant & Co., Connell & Dengler Machine Co., and Heston & Anderson are just a few of the other makers of swing saws. Swing saws are well suited for rough work but not to the precision work of a cabinetmaker or patternmaker. C. B. Rogers & Co. patented and manufactured a crosscut saw better suited to cabinetmakers. The C. B. Rogers saw used a large circular sawblade held in a fixed position above a sliding table. This saw worked well enough but required a lot of floor space and was costly to manufacture. In the late 1880s, S. A. 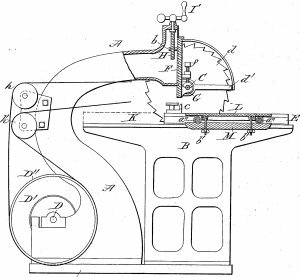 Woods Machine Co. introduced a newly patented tablesaw where the work is held fixed and the blade is pulled forward through the work. This type of saw is better suited to crosscutting long or awkwardly shaped stock than an ordinary tablesaw; The Schamb Mill, maker of oval picture frames, uses an older, wooden-frame version of this type of saw. 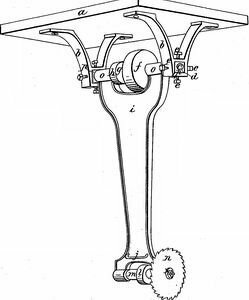 The patent drawing and advertisement above show Mackintosh Hutchinson's floor-mounted saw. 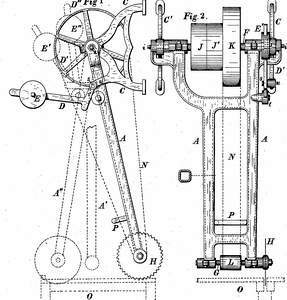 Hutchinson's saw is not a modern design because it is powered by a belt (to a line shaft or motor), which complicates the mechanicals compared to a direct-drive saw. Hutchinson sold this saw both under the Mackintosh Hutchinson name when he lived in Toronto, and under the Hutchinson Manufacturing Co. name when he was based in Norristown, PA. In about 1924, Raymond De Walt invented the direct-drive radial arm saw, which brought crosscutting into the modern era. 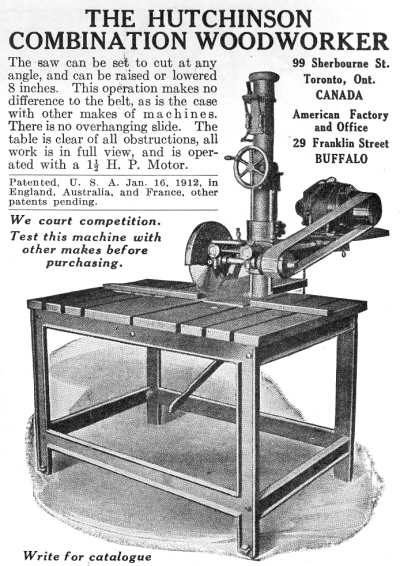 See Early History of Radial Arm Saws for the rest of that story.